Horror of all horrors! Quetzalcoatl, feathered serpent of Venus, has finally grown weary of the enraging lack of human sacrifice. Watch as the lord of storm descends upon us. His mighty wings block the sun. We are engulfed in darkness as the sky is torn asunder and the rains of flood and winds of tempest strike at the pitiable earth. Woe to us all! Who among us will be the first sacrifice? For the plumed snake hungers for human flesh. Oh, wait... It's actually a small insect with a wonky neck. Snakeflies! The snakiest of flies and the wonkiest of necks. Second wonkiest. 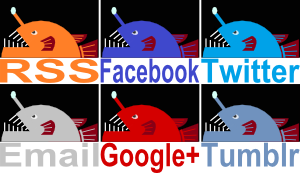 They are some 200 species found in the temperate climate of the northern hemisphere. They live in Europe, parts of Asia and the western side of North America. Places like Spain are about the hottest parts of the world they can tolerate. Take THAT, tropics! Snakeflies make up an ancient group called Raphidioptera. 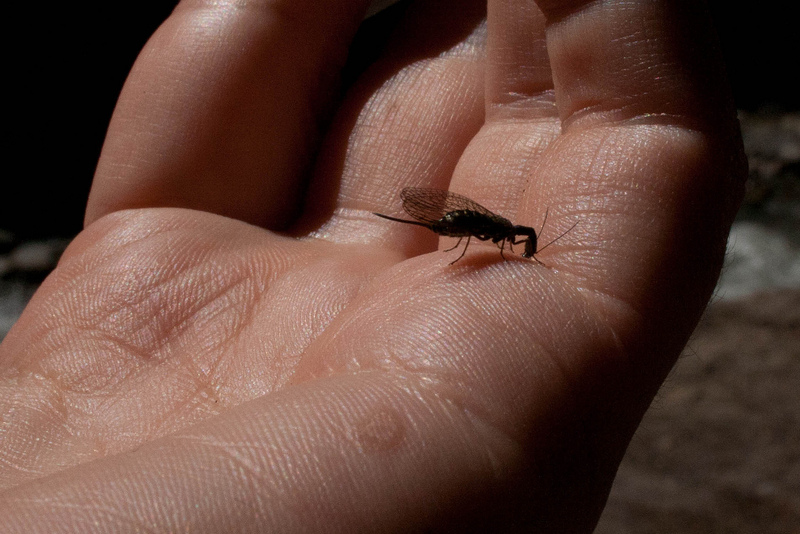 They were once considered to be a kind of net-winged insect, like the Lacewings and Antlions, but they're now placed within their own, closely related order. Alas, no Antsnakelionflies just yet. 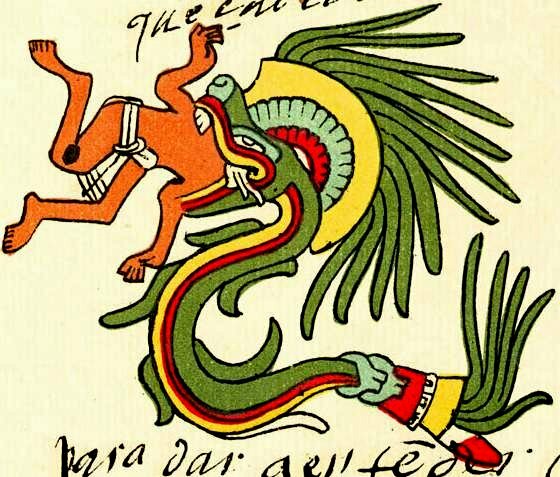 Though the original Chimaera was a liongoatsnake so we're not too far off. Snakeflies obviously get their name from that bizarre, long neck upon which their flattened head perches. They're carnivorous, but they don't eat things bigger than their own head as actual snakes do. Instead, they prefer to munch on aphids, mites and other small, frequently soft-bodied prey. It's just easier that way. Female Snakeflies also have what looks a bit like a snake's tail! It's not a tail. Neither is it a stinger, which might be something of a relief. 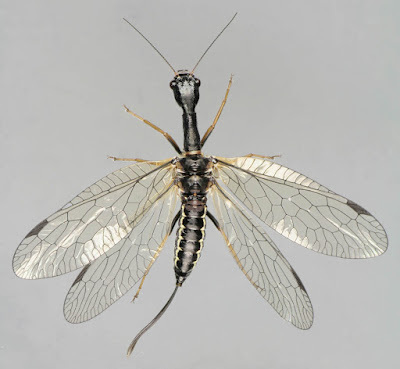 It is, however, the reason why the Snakefly order is called Raphidioptera, which means "needle wing". Snakeneedlefly. I've always wanted one of those. The so-called needle is, of course, an ovipositor. 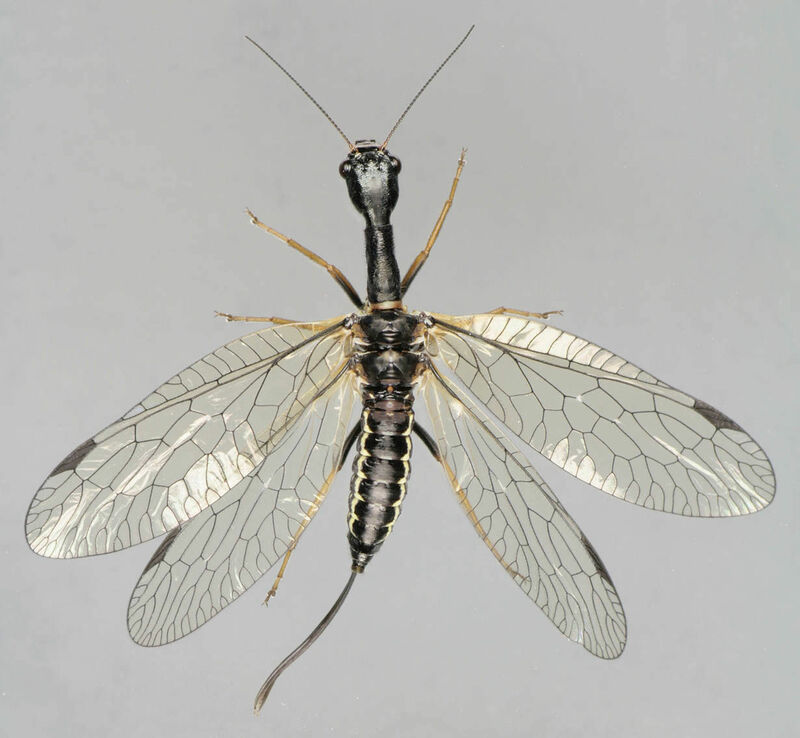 Mrs. Snakefly uses it to drill into soil or tree bark and lay her eggs in a safe, hidden place. The eggs soon hatches to reveal something that looks like a small, chubby Snakefly with no wings. Their head and thorax are quite tough and hardened but the abdomen is long, soft and just begging to be filled with grub. 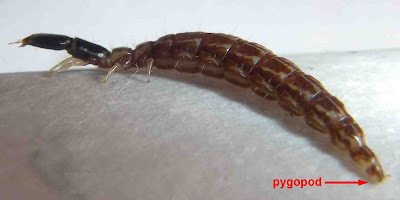 They do in fact eat grubs, often the larvae of wood-boring beetles. They also feed on caterpillars, aphids and insect eggs. It's a diet similar to that of their parents, they just need it to be even softer. Just like real babies. 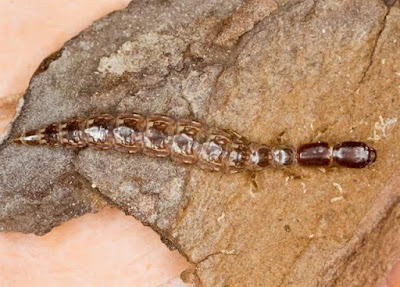 Snakefly larvae scurry around the tree bark or leaf litter using six, small legs that appear wholly insufficient to the task of hauling that rapacious stomach around. They don't even have the fleshy prolegs you see on caterpillars. Instead, they have a sticky organ at the end of their abdomen and I guess that serves well enough. After a good year or two of ever increasing gluttony, it's finally time for the larva to pupate. The pupa looks even more like an adult Snakefly, but this time with small wing buds. It can even crawl around! This is good since some species might stay like this for 10 whole months. That must get terribly boring when you've just spent years hunting aphids and now you're waiting to get your wings. Adolescence is seldom that awkward. In any case, the adult emerges after a minimum of several weeks, takes flight and goes right back to hunting aphids and stuff. 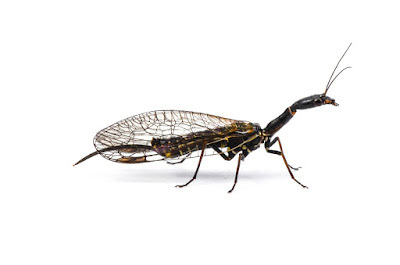 It's a lifestyle (and a neck) that has served them well for millions of years; Snakeflies have scarcely changed at all since the Jurassic period. These guys are awesome. And you can say that again about them being unchanged. They hardly change much at all throughout their lifespan! 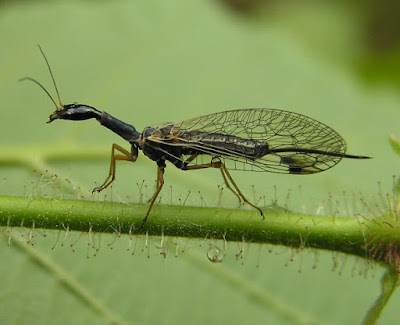 Can you imagine the aphids attempting to worship the snakefly and appeasing it with sacrifices? @Porakiya Draekojin: I know! They just lose their baby fat. @Crunchy: Ha! I just can't keep up with all these rules and expectations! @Esther: Wow, now that would be amazing! They already kind of have that with ants. The aphid pantheon is so mysterious.